The exterior of an elegant shop along Rue du Marche in the Old Town of Nice in Provence, France which is beautifully designed with a specially created sign out front. 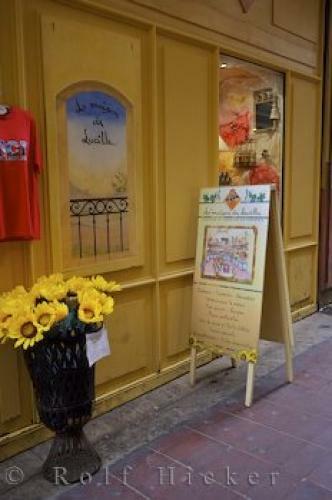 The sign outside this shop is elegant in itself with all of its creative writing and designs adorning it, but once you step into this shop along the Rue du Marche in the Old Town of Nice in Provence, France, the elegant displays are breathtaking. The exterior is done in light colored wood with the interior walls matching only the design is much more exquisite.Outside, there is a red touristy shirt hanging above a bright yellow basket of artificial flowers which makes a nice arrangement for any home or office. The red brick flooring makes the entranceway shine with class luring in many visitors who come to the Old Town of Nice in Provence, France on their vacation.Shops along Rue du Marche in Old Town, Nice, Provence, Cote d'Azur, France, Europe. the Old Town of Nice in Provence, France.